The Interface Collection has many implementations and a hierarchy quite wide. After the creation of the iterator , structure is modified at any time by any method other than iterator's own remove method. If one thread is modifying the structure of the collection while other thread is iterating over it . You can consult documentation in Oracle any collection this says: Note that the fail-fast behavior of an iterator cannot be guaranteed as it is, generally speaking, impossible to make any hard guarantees in the presence of unsynchronized concurrent modification. Fail-fast iterators throw ConcurrentModificationException on a best-effort basis. Therefore, it would be wrong to write a program that depended on this exception for its correctness: the fail-fast behavior of iterators should be used only to detect bugs. So what would be a way to validate? Iterator read internal data structure (object array) directly . The internal data structure(i.e object array) should not be modified while iterating through the collection. To ensure this it maintains an internal flag "mods" .Iterator checks the "mods" flag whenever it gets the next value (using hasNext() method and next() method). Value of mods flag changes whenever there is an structural modification. Thus indicating iterator to throw ConcurrentModificationException. 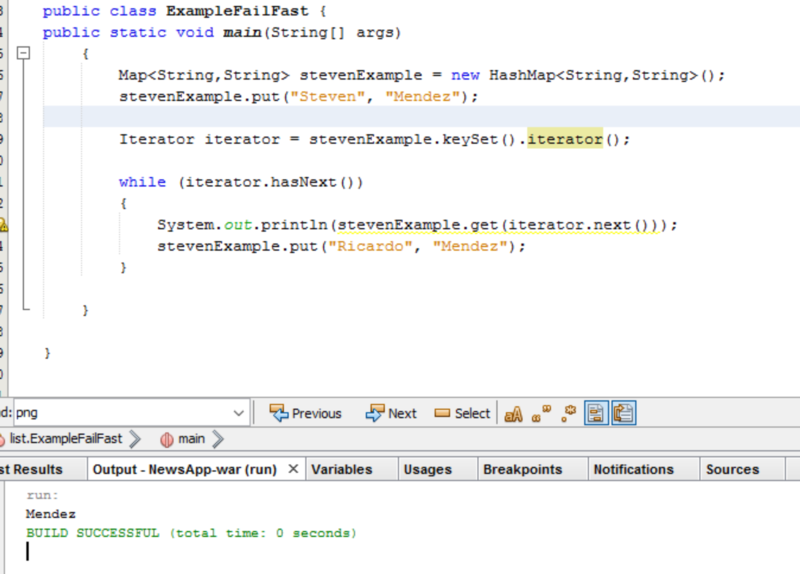 Fail Safe Iterator makes copy of the internal data structure (object array) and iterates over the copied data structure. Any structural modification done to the iterator affects the copied data structure. So , original data structure remains structurally unchanged .Hence , no ConcurrentModificationException throws by the fail safe iterator. Overhead of maintaining the copied data structure i.e memory. Fail safe iterator does not guarantee that the data being read is the data currently in the original data structure. According to Oracle docs , fail safe iterator is ordinarily too costly, but may be more efficient than alternatives when traversal operations vastly outnumber mutations, and is useful when you cannot or don’t want to synchronize traversals, yet need to preclude interference among concurrent threads. The "snapshot" style iterator method uses a reference to the state of the array at the point that the iterator was created. This array never changes during the lifetime of the iterator, so interference is impossible and the iterator is guaranteed not to throw ConcurrentModificationException.The iterator will not reflect additions, removals, or changes to the list since the iterator was created. Element-changing operations on iterators themselves (remove(), set(), and add()) are not supported. These methods throw UnsupportedOperationException. Do not you know ? LinkedList has better use of memory, when they need to grow. But your inserting/searching/removing approach can be slow when the List is big. The thing here is take in consideration what is better performance respoonse / performance memory. Everything is linked to amount of elements.